Icom programming software allows you to set frequencies and functions within your Icom radio. 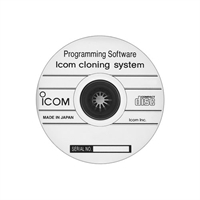 Also know as Icom Cloning Software, this software is easy to use and runs on your PC under the Windows Operating System. You can set each channel's frequency and privacy codes, set functions for each programmable key on your radio, set parameters such as delay time for the Time-Out-Timer, and many other functions available with each radio model. Once you set up the radio parameters, you can save the settings and use them to program multiple radios with the same settings. See our Icom Programming Software Guide for a list of software & cables by radio. Warning Be advised, serious penalties and prosecution can result from the unlicensed transmission on frequencies which require a license, and/or interference with public safety transmissions. All Land Mobile radios (LMR) require an FCC license to operate.